Albert Delano Cobb 77 of Beulah died December 5, 2018 peacefully at home surrounded by his loving family. 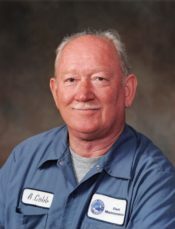 Mr. Cobb was a native and lifelong resident of Beulah and retired from the Escambia County Road Dept., after 40 years as a Heavy Equipment Diesel Mechanic. Survivors include his loving wife, Mary Lou Cobb of 59 years; son Arman Delano Cobb, twin daughters Anna Marie Cobb (Palmer) (Pat Palmer), Sanna Shariee Cobb (Peacock) (Guy Peacock), and eight grandchildren Daniel & Patrick Scully, Dakota Cobb, Paige, Patrick, Payton, Parker Palmer, and Marlin Peacock. Brother Alex Devereau Cobb (Marina), and Sister Doris (Cobb) Smith and many nieces and nephews. Red enjoyed fishing, hunting, and dirt track racing in his younger days, watching Nascar Races, and cooking on Sundays for his family. His favorite things in life were spending time with his family, his wife’s Mexican food, and road trips to her home town in, Omaha, Nebraska to visit family. During the past eight years his two youngest “grandbabies” Payton and Parker enriched his life bringing back a special youthfulness when spending time with them. Pensacola Memorial Gardens will facilitate arrangements beginning with viewing for family 4-5 pm, friends and family at 5-7 p.m. Friday December 7, 2018. Services will be held at Windy Hill Baptist Church, 12/8/2018 @ 11:00 a.m. with graveside service at Beulah Baptist Cemetery. Pallbearers will be sons-in-law; Guy Peacock, Pat Palmer; grandsons, Daniel Scully, Dakota Cobb, Patrick Palmer, and Marlin Peacock. We go back a few years to the landfill then to the road department Red and I knew each other about 20 years.